Picket Fence Design: Did you go to Target? 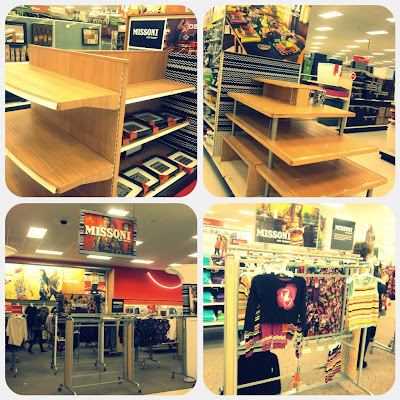 I was surprised to see that in just a few hours, most of the shelves were bare! I knew the Missoni line was going to popular, but I had no idea the store would practically be cleaned out in just a few hours. I happen to have some time this morning and I was just curious to see the items in person. Target's website has been down all day too. Amazing. Here's an article about it from the New York Times. I managed to grab just a couple of items for my little girl. Were you able to get anything you've been eyeing? Oh that little girl outfit is actually really cute! In my opinion most of the Missoni for Target stuff - at least the womens' clothing - is not something I would want to buy. If it's not the colors in the pattern, it's the cut of the garment. The black and white print was OK, kinda chic, but I wasn't going to spend $30 for a laptop sleeve in that print or $10 on an eye mask. 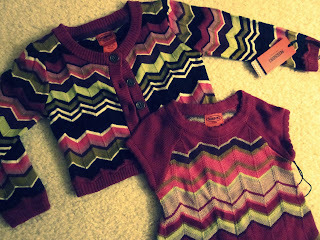 In looking at the Missoni stuff on the Target website (which is all sold out), I couldn't find anything I would actually wear. I went last night and they had a few of the pictures left but I saw no reason I would want to hang a framed tile on my wall. It's not even some kind of status symbol because it's just from Target. I guess I just don't get it! I ended up finding a shirt in another brand that had similar multi-colored zig-zags that I thought was prettier than the Missoni stuff. Heh. Of course, if Target got more Missoni in stock I would go take a look, just to see if I can figure out what the hype is about! OK so I checked again and they do have some really cute blankets. I think it's just the women's clothing that I don't like because it's not my style. But those patterns work for kiddie clothes and totes and blankets.